Intimidated by the dire warnings about Cyclone Cook, we changed our plan to go away this Easter and were at home on Friday and Saturday. 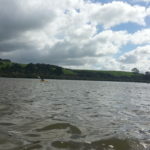 When it became obvious that the storm had almost completely by-passed Auckland, we loaded the kayaks on the motorhome and headed north on Sunday. 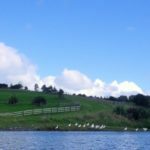 We knew that high tide on the Kaipara would be just after mid-day, so we drove to Brynderwyn and turned towards Dargaville just before the hill. The NZMCA app listed a park-over place near Maungaturoto, so we stopped to check it out. It didn’t appeal, but just down the road we discovered a wharf near the top of the Wairau River. Wairau translates literally as “many waters”, which explains why there are so many NZ waterways with this name. 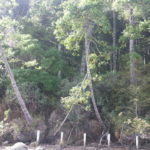 This Wairau joins up with the Kaiwaka River a few kilometers downstream, then becomes the Otamatea River leading to the Kaipara Harbour. 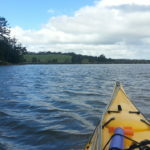 There was a nice boat ramp, so it looked to be ideal for a kayak trip on Monday. Just up the road was a car-park on the edge of the river which looked like a great place to park for the night, considering the absence of any “no camping” signs. I parked the motorhome as discreetly as I could and we made coffee. Since we were at one end of the Maungaturoto community walkway, we pulled on our boots and set off for a walk. It was mostly over farm paddocks, but a couple of sections ran through pretty native bush. The track doesn’t look like it gets much use. It took us a bit over an hour, although Felicity used some of that time to gather a bag of tasty watercress from a stream we passed. While we waited for the tide to come in next morning, we checked out another section of the walkway which we had spotted across the road. This bit was quite steep, and doesn’t look like it has been used much at all since it was built. I had seen several local mothers with pushchairs walking on the road in preference to the walkway. When we thought there was enough water in the river to be able to launch without getting too muddy, we unloaded the kayaks and set off. Although the tide was coming in, there was a bit of a current flowing down so it wasn’t too hard going at first. 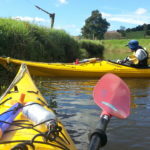 It became a bit more of an effort after lunch when we had to battle wind and tide back down the Kaiwaka river. Just around the first corner, Felicity spotted four white, royal spoonbills sitting on a sand bank. The only time we have seen them before was at Okarito down in Westland, so it was a thrill to see them here. It turns out there is quite a big colony in the upper Kaipara, and that they are actually immigrants that have slowly spread throughout the country since they were first seen in 1861. As we neared the railway bridge across the river, it began to rain and we tried rather unsuccessfully to shelter beneath it. I decided to take my buoyancy aid off and put my jacket on, which of course meant that the clouds quickly blew away and the sun came back! 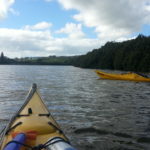 While I was doing this, Felicity had drifted and been blown about half a kilometer up the Kaiwaka river, so I caught up to her and we looked for a spot to land and eat lunch. 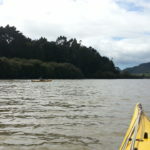 On the way back upstream to Maungaturoto (“mountain near water”), we paddled past kauri trees growing right on the river edge. Some were leaning out precariously, and I could see that their future is bleak. One of the landowners has clearly tried to stabilise the banks in some way, as you can see in my photo, but the waves are currently winning. 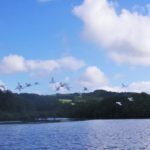 As we neared the ramp, we came across a whole flock of spoonbills, which you can see in Felicity’s photos. 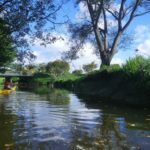 We were enjoying our paddle so much that we decided to explore upstream, continuing past the landing and under the highway bridge. 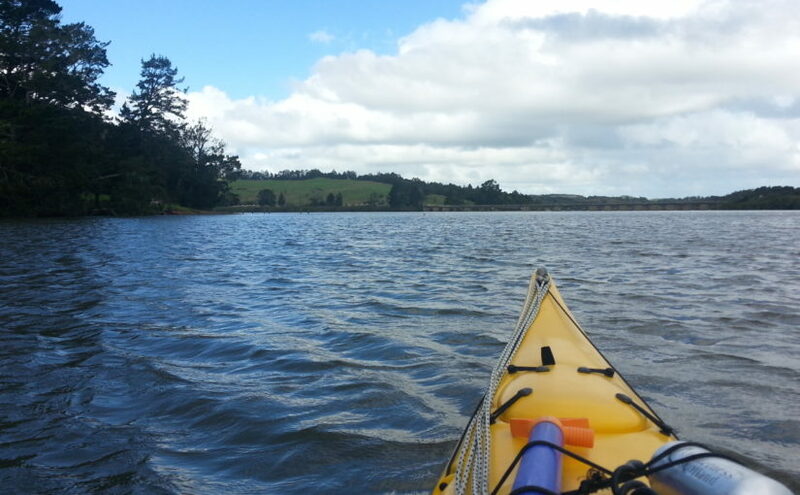 The river was navigable for quite a way further, and we ended up around the back of the Fonterra dairy factory. There was a new-looking sign on the bank, so after landing and slopping through the mud to dry land I was able to read that the area is an important whitebait breeding area, and that I should stay away from the water’s edge to avoid damaging their eggs. Unfortunately, my boat needed to be dragged back across that very water’s edge, so no doubt kilos more potential whitebait bit the dust. 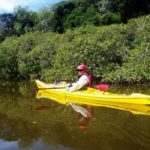 When we had packed the kayaks back on the motorhome, we looked at the various tide times and realized that Mangawhai and the Tara Creek might be a more suitable destination for a mid-morning paddle. It didn’t take long to drive over to the east coast and settle into the Riverside Holiday Park. We had to pay, but we got a great spot on the edge of the estuary looking out to the sun setting behind the hills. They also had a great shower, controlled by a token. Both Felicity and I had to stay in about three times longer than normal, waiting for the timer to run out. I’m sure I have paddled up this river before, but Felicity is equally sure we haven’t. So far there are no documentary photographs, or mentions in this blog. It was very pleasant nonetheless, and we continued up under the road to Waipu Cove and deep into farm land. 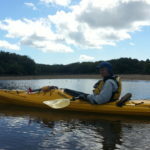 In the photo, Felicity is doing a 15-point turn so that she can head back downstream. The banks were very muddy for quite a way, so it wasn’t easy to find a lunch spot. We ended up sitting on a stone sculpture at the end of a sandbar outside an expensive-looking house. There were no signs of life and we weren’t disturbed. Our Google navigator instructed us to turn down Kaipara Flats Road on the way home, and zip around the back of Warkworth to avoid congestion. As we were re-joining the main highway at Woodcocks Rd, I saw a couple of big trucks go past that had been about four vehicles in front of us before we took the detour. Now they were a over a dozen ahead!